(The Root) — Poor Mitt Romney has lost his way. On the road to the Republican National Convention in Tampa, Fla., he appears to have taken a detour into the swampland of Birtherism. Last Friday, during a campaign rally in his home state of Michigan, Romney said, "I love being home, in this place where Ann and I were raised, where both of us were born. Ann was born at Henry Ford Hospital. I was born at Harper Hospital. No one's ever asked to see my birth certificate. They know that is the place we were born." The largely white crowd laughed and cheered. This was yet the latest example of Romney appeasing the modern Republican Party's wing-nut faction, which continues to promote the lie that President Barack Obama wasn't born here. Though the GOP candidate and his campaign spokesmen have dismissed all criticism of his comments by saying that they were simply a "joke," it is very clear that Romney seeks to curry favor with the Republican base, 50 percent of whom question Obama's nationality. Romney's proud endorsement from famed Birther Donald Trump — who was scheduled to speak at the RNC before Tropical Storm Isaac caused a change of plans — and Arizona's Sheriff Joe Arpaio's spot on the RNC lineup are a testament that Romney is comfortable associating with those who espouse vitriolic Birther rhetoric and seek to undermine President Obama's legitimacy. So is Romney a Birther? That isn't clear; nor does it matter. What matters is that many Republicans remain suspicious of Romney's candidacy, his Mormon faith and his credentials as a diehard conservative. Years of flip-flopping and constant reinvention have given Romney a reputation for being disingenuous at best and a fraud at worst. And that's among fellow Republicans. He needs to convince the GOP base he's one of them — and this means employing dog whistles that are easily understood but plausibly denied. 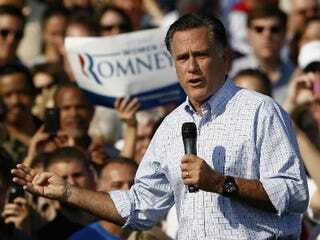 Romney has drifted away from his own message about jobs and the economy. He originally claimed that he could solve the nation's economic ills by using the skills he'd honed in business. The campaign, he said, was going to be about the country's future and getting the nation "back on track." But Romney appears to have been sidetracked by his own carnival barking. In just the past two weeks, Romney's campaign launched attack ads falsely accusing President Obama of destroying the work requirement in welfare reform. This, of course, is an old, racially tinged tactic to paint Obama as a big-government spender on the undeserving poor — namely, black and brown people. Romney would argue the ads have nothing to do with race, in the same way his campaign adviser Kevin Madden has said that the "joke" in Michigan had nothing to do with Birtherism. Madden offered an awkward explanation that Romney "was only referencing that Michigan … is the state where he himself was born and raised." Sure. But what, pray tell, does that have to do with birth certificates? Mitt Romney enjoys an inherent privilege of whiteness. In fact, since the nation's foundation — and up until the recent past — only white males were granted the full democratic freedoms expressed in the Declaration of Independence. Whiteness, in and of itself, has been a de facto synonym of Americanness — or at least the rights thereof. The desire by some Republicans to deny Obama his birthright — refusing to afford him the respect of the office he now holds — is rooted in the dark annals of African-American history. This is a story that began with chains and suffered a three-fifths compromise. The concept that blacks were not fully American was written into the Constitution. Any allusion that seeks to blight the president, using metaphors that reflect the remnants of that insidious past, is nothing to joke about. Romney's flippant approach to the blatant racism alive and well in his party reveals a white male privilege that he enjoys at the expense of others. Adam Serwer of Mother Jones writes: "The problem with Romney's 'joke' [is that] it falls into a long list of remarks that suggest an emotional myopia based on an extremely sheltered life experience. It comes across as gloating about the fact that, as a rich white man born into a wealthy and powerful family, Romney has rarely been subject to the kind of racist or sexist assumptions that clog the daily lives of millions of Americans. Romney might as well joke that he's never been mistaken for a waiter in a restaurant or a clerk in a retail store, or that he's never been selected for extra screening at an airport or randomly told to empty his pockets by the NYPD." America's original sin has left an indelible stain on the national consciousness that rewards whiteness a kind of pass, while casting shadows of doubt and suspicion on blackness. Romney's joke wasn't a joke at all: It is the tortured story of "separate and unequal." It's why Obama was forced to "show his papers" but Romney casually ignores calls for his tax documents. On some level Romney can't be blamed for being the beneficiary of a privilege he did not create, but Romney is guilty of feigning ignorance while employing code words, dog whistles and engaging in dirty racial politics. Romney is a wealthy private-equity magnate who has enjoyed a Harvard education and bank accounts in tax havens from Switzerland to the Cayman Islands. He's trying to win an election using the votes of poor, working-class white Americans — who make up the Republican base — some of whom remain resentful of Barack Obama's ascendency. Given that political reality, Romney can't sell himself as a man of the people because his life is so starkly more privileged and out of touch with the very voters he's courting. So instead he appeals to their prejudices and deep-seated racial anxieties. Romney may speak in jest about matters of import and hide behind political maneuvering, but we've seen and heard it all before — and it's no laughing matter. Edward Wyckoff Williams is contributing editor at The Root. He is a columnist and political analyst, appearing on MSNBC, Al-Jazeera, CBS Washington and national syndicated radio. Follow him on Twitter and on Facebook. Edward Wyckoff Williams is a contributing editor at The Root. He is a columnist and political analyst, appearing on Al-Jazeera, MSNBC, ABC, CBS Washington and national syndicated radio. Follow him on Twitter and on Facebook.